Walmart believes that all people deserve safe, healthy working conditions that are free from coercion. Though we are one actor among many, we recognize these risks and the importance of multistakeholder efforts to improve conditions for workers in the global supply chain. Through our Responsible Sourcing program and collaborative initiatives, we’re working to promote dignity and respect for the men and women who make the products we sell. We are also working with other companies, governments and nonprofit organizations to help improve working conditions and employment opportunities for workers around the world, beyond those who work for our suppliers. Promoting worker dignity not only benefits the workers, their families and communities, it also strengthens our business. When workers have what they need, product supplies remain more stable, and quality is often improved. 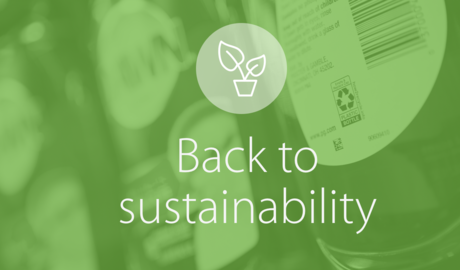 In addition, we know that our customers want products that are sustainable not only for the environment, but also for the people who make them. Walmart values the men and women who produce the products our customers want. We expect our suppliers and their facility managers to provide workers with safe and healthy employment conditions and are working with them as well as other stakeholders to enable them to do so. We consider the well-being of workers across our supply chain to be a high priority. Our Standards for Suppliers make clear our fundamental expectations regarding—among other things—the treatment and safety of workers. Walmart’s Standards for Suppliers are available on our website. We expect our suppliers and their facilities to comply with these standards. We also want facility workers themselves to know our expectations of suppliers and facility management and to report instances of noncompliance. Walmart uses these reports to inform potential investigations and auditing decisions. All facilities within the scope of the Walmart Responsible Sourcing program must be disclosed to us and available for an audit. If we find that a supplier is producing merchandise in, or subcontracting to, an unauthorized facility, that supplier may lose the ability to do business with Walmart. Auditing the supply chain. 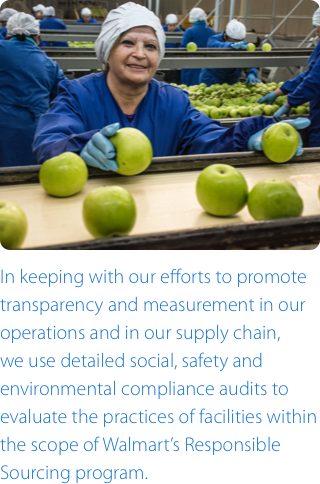 In keeping with our efforts to promote transparency and measurement in our operations and in our supply chain, we use detailed social, safety and environmental compliance audits to evaluate the practices of facilities within the scope of Walmart’s Responsible Sourcing program. Audits focus on a variety of areas, including whether workers are properly paid for all hours worked; all labor is voluntary; facilities comply with all child labor laws and standards; working hours are not excessive and are consistent with local laws or regulations; and that facilities meet health and safety standards. Audit results are assigned a color rating based on the type and severity of issues found, and facilities can be re-audited on a schedule based on those ratings. We use these ratings to help make decisions regarding our use of particular suppliers and facilities. Audit results are sent to suppliers using that facility, and it is the suppliers’ responsibility to work with facilities to remediate audit findings. Taking a risk-based approach to auditing. We allocate more auditing resources to facilities located in countries that pose higher potential risks to worker safety and well-being. Using the Worldwide Governance Indicators from the World Bank, we assess potential risk of noncompliance by considering factors such as government effectiveness, rule of law, control of corruption and government stability. In the future, we may evolve our risk-based approach to include additional factors such as industry- or supplier-specific risks. Piloting a third-party audit approach. Through a pilot that launched in FY2017, we are exploring the possibility of using selected third-party programs for facility audits instead of requiring a traditional Walmart Responsible Sourcing audit. We are reviewing pilot outcomes and exploring opportunities to expand this approach to our global program, using widely adopted and internationally recognized third-party audit programs. 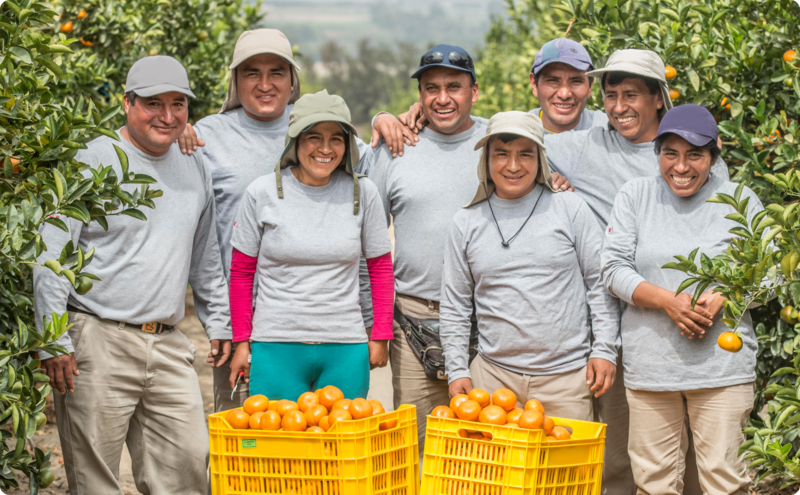 In addition to enhancing the impact of our Responsible Sourcing program, we believe this new approach will help us focus our resources on addressing priority supply-chain risks such as forced labor, underage labor and unsafe working conditions. For more information about our Responsible Sourcing auditing and audit ratings, please visit Walmart’s corporate website. Responsible Sourcing Audit Orientation provides new suppliers and facilities with training in social and environmental compliance; fire, chemical and machine safety; dormitory and canteen standards; region-specific trends; and more. Violation Correction Training addresses common trends related to social and environmental compliance by offering root-cause analysis and methods to address those issues in locally relevant ways, culminating in the development of plans to remedy potential violations. Orange School Program trains facility managers to identify noncompliance issues and develop a systematic approach to continuous improvement using root-cause analysis methodology and procedures. Supply Chain Forum invites suppliers and facilities from similar sourcing regions to discuss issues and share best practices. Training Your Supply Chain Guide provides best practices and tools to help suppliers and facilities through large classroom training sessions as well as informal conversation. Stronger Together Forced Labor eLearning modules (Global and U.K.-focused) help suppliers understand the nature of forced labor in supply chains and possible indicators and risk factors. Many of the greatest risks to worker dignity are complex, systemic and industry-wide issues that no single organization can solve. By working with industry stakeholders, nonprofit organizations, governments and others, we are striving to improve transparency, empower workers and create positive change throughout supply chains. Aligning industry associations around a common approach to responsible labor practices. Walmart jointly chairs the Produce Marketing Association’s Committee on Responsible Labor Practices, which aims to drive industry-wide approaches to managing risks in produce supply chains down to the farm level. In 2014, Walmart joined the Fair Food Program, a partnership of farmworkers, Florida tomato growers and participating retail buyers organized by the Coalition of Immokalee Workers (CIW). 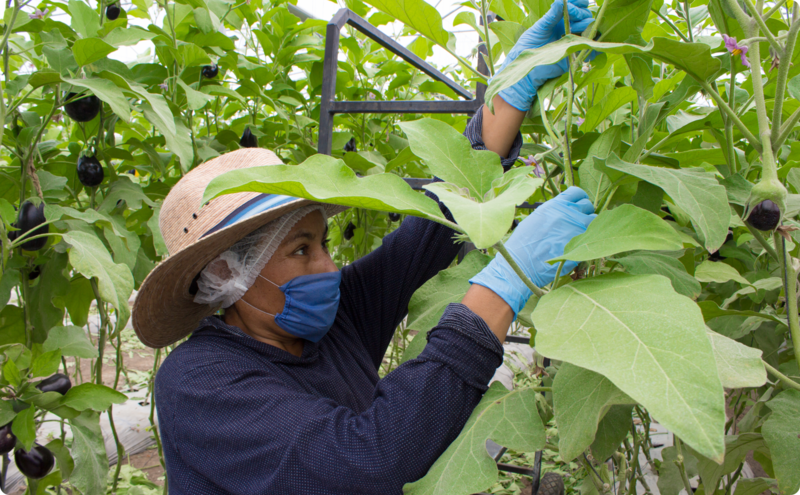 The Fair Food Program encourages humane working conditions for the workers who pick fruits and vegetables on participating farms. By participating in the program, we purchase from suppliers who best reflect the principles of the Fair Food Program. 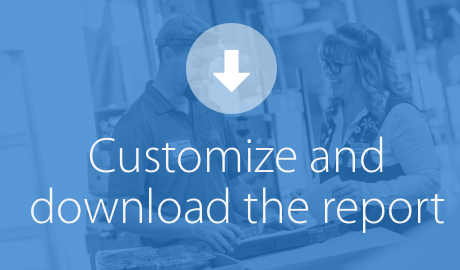 Strengthening supplier accountability. In 2015, we began assessing the viability of combining tools—such as grower self-assessments, supplier capability assessments and verification audits—to better manage risk at the grower level. We will continue to assess results as we work to understand how best to address potential risks upstream in our supply chain. Promoting responsible recruitment practices. Walmart believes that the men and women who work in the global supply chain should be recruited and employed responsibly. In FY2017, we joined the Leadership Group for Responsible Recruitment, and we will continue working with other stakeholders to foster progress on responsible recruitment practices in the supply chain. We are also a member of the Consumer Goods Forum (CGF), which announced a resolution in January 2016 to address forced labor as an industry priority. The CGF brings together more than 400 retailers, manufacturers and service providers in the consumer goods industry to create positive change across the retail industry. Walmart also participates in CGF’s Social Sustainability Committee, which works to drive global collaboration in identifying and tackling key social sustainability issues for the industry. Developing a training marketplace. 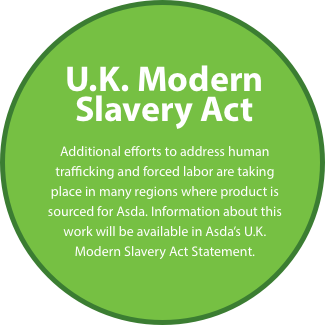 Asda, Walmart’s business in the U.K., supports Stronger Together, a multistakeholder initiative aiming to reduce the risk of human trafficking, forced labor and other hidden third-party exploitation of workers in the supply chains of U.K. companies. Stronger Together provides downloadable resources for employers, labor providers, workers and worker representatives. Promoting compliance with environmental and labor standards. Walmart participates in the Seafood Task Force, an initiative established by a group of seafood processors, feed producers, buyers, retailers, government representatives and nongovernmental organizations working together to address issues surrounding labor conditions and illegal fishing in Thai seafood supply chains. The group’s board of directors includes a representative from Walmart’s Responsible Sourcing organization. Investing in innovation. In prior years, the Walmart Foundation awarded grants to International Justice Mission (IJM) and Issara Institute to develop a comprehensive set of data, and analytics and innovative tools to assess the nature and prevalence of forced labor and trafficking in the Thai seafood sector. A new $2 million, two-year grant from the Walmart Foundation awarded to IJM in FY2017 is helping IJM to apply casework and criminal analytics to end impunity for traffickers in the Thai fishing industry. IJM will use the award to establish a field office in Bangkok to implement the program. IJM anticipates that cases will be generated from a combination of IJM-initiated investigations and referrals from local civil society and nongovernmental organizations. The Walmart Foundation grant to Issara Institute is helping it to use analytics, technology and collaborations to help reduce the risk of slavery from global supply chains by elevating worker voice though education and access to hotlines. Investing in tools. The Walmart Foundation awarded $2 million to Polaris Project, a nonprofit organization that works to disrupt human trafficking by equipping key stakeholders and communities with tools to identify, map and eliminate trafficking networks. Polaris is working with Consejo Ciudadano, a Mexican nonprofit organization that operates a crisis hotline, to increase capacity to track and respond to reports of trafficking. Collaborating within the industry. Walmart is a founding member of the Alliance for Bangladesh Worker Safety, a group of brands and retailers seeking to develop safer working conditions for men and women in the ready-made garment industry in Bangladesh. According to the Alliance’s third annual report, published in October 2016, it has trained more than 1.2 million factory employees on initial basic fire safety; provided a helpline in more than 800 factories that workers can use to anonymously report safety or other job-related concerns; and provided, together with factory owners, wages for more than 6,600 displaced workers. It has also published the results of factory inspections on its website, along with corrective action plans for factories entering remediation. Investing in training and engagement. 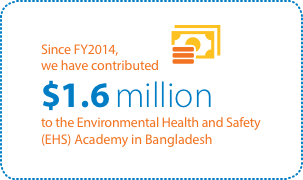 Since FY2014, Walmart contributed $1.6 million to the Environmental Health and Safety (EHS) Academy in Bangladesh. The purpose of EHS Academy is to provide a local, long-term platform for addressing fire safety challenges in the supply chain through technical training and engagement. Walmart also works with the Better Work Program in several countries. The International Labour Organization and the International Finance Corporation launched the Better Work Program to improve factory working conditions in the garment sector. Program activities include monitoring factories, training workers and engaging with key stakeholders, including workers, factories, communities and governments. Health and Safety (EHS) Academy in Bangladesh. The purpose of EHS Academy is to provide a local, long-term platform for addressing fire safety challenges in the supply chain through technical training and engagement. Walmart also works with the Better Work Program in several countries. The International Labour Organization and the International Finance Corporation launched the Better Work Program to improve factory working conditions in the garment sector. 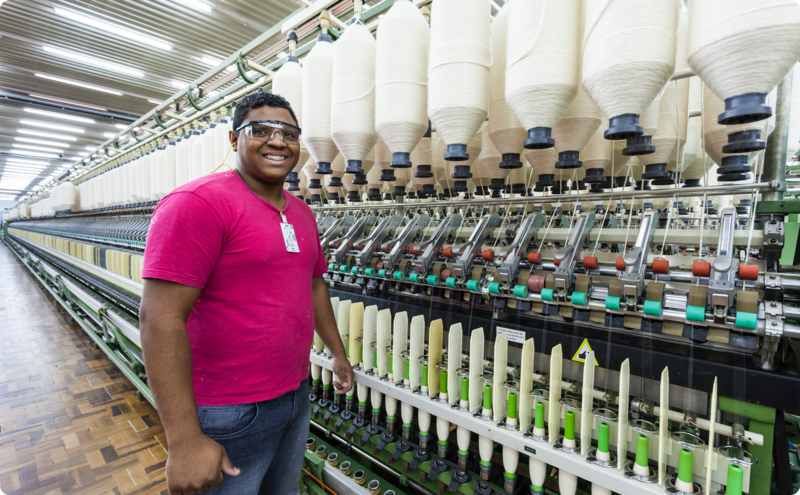 Program activities include monitoring factories, training workers and engaging with key stakeholders, including workers, factories, communities and governments.